I missed a book in the series, as the last Executioner book I read was #20, New Orleans Knockout. However, when one misses a book in the series, it’s not like missing an episode in the serial. Although I might miss a couple references to prior characters, it doesn’t completely hang upon what happened then. 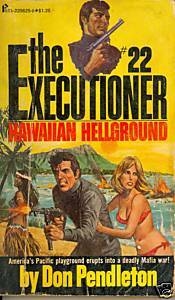 This book sends Mack Bolan to Hawaii, where he encounters some recurring characters and they get together to bust up not just a mob plot, but a plot from a Red Chinese general, possibly rogue, who is using a secret volcano lair for ill. Strangely, though, the hit on the lair doesn’t play out like a secret agent novel would; instead, it’s a pretty straightforward assault, and a bit anti-climactic as a climax for the novel. So it’s not one of the better ones in the series, or I wasn’t in a proper appreciative mood. That said, the novel is noteworthy for the number of times it refers to a karate wraparound or a terrycloth karate wraparound. Kung fu movies were emerging in the culture, but I guess the word gi had not made it across the pacific just yet.